Ok, I’ll be honest–I’m posting this right now because I hate the photos so much that I just want to get it over with. Seriously, I’m that vain you guys. See, it’s not quite fair because this bread is not only delicious, but it’s the ultimate weeknight loaf. Somehow you too can have a loaf of fresh, leavened bread in under two hours–something of a small miracle–and, even more perfectly, you only need a few pantry ingredients. Heidi Swanson is a genius for unearthing this recipe and, even though my photos don’t do it any justice, you just have to try this bread if you’re gluten-tolerant. I saved this recipe back in 2011 (and migrated it to Pinterest this summer) and I’m oh-so-glad that I did. Nutty, salty, and with a nice crumb, it’s not going to pass for bakery bread, but it hits the spot when it’s a cool, autumn night and you just want a little something to go with a bowl of soup (that recipe coming tomorrow!). 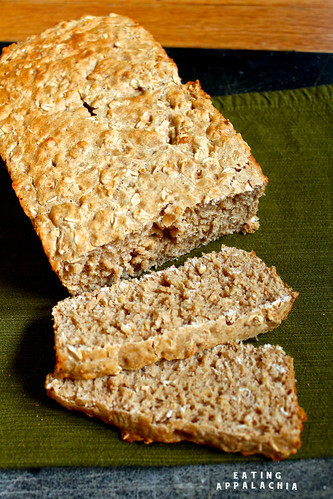 Since it needs only oats, flour, and salt, you’re good to go with this easy, tasty, little loaf. In a medium bowl, sprinkle the yeast onto the warm water and stir until the yeast dissolves. Stir in the agave nectar and set aside for a few minutes, until the yeast blooms and swells a bit – 5 – 10 minutes. Oil a loaf pan. Turn the dough into the tin, cover with a clean, slightly damp cloth, and set in a warm place for 30 minutes, to rise. Preheat the oven to 350F with a rack in the middle. When ready, bake the bread for 35-40 minutes, until golden and pulling away from the sides of the pan. Remove from oven, and turn the bread out of the pan quickly. Let it cool on a rack so it doesn’t steam in the pan. Serve warm. I’m so glad you’re doing VeganMoFo again! Mostly because I need some new recipes in my rotation, and yours are some of the best. I can’t wait to try making this bread – I have all the ingredients all ready, and I’ve made one too many sad loaves of sourdough in the last few weeks. I love quick and easy yeast breads! The pictures make me want to scarf down the whole loaf, so you definitely did it justice! I think you would like the black bean cookies. If Mr. Wing-It liked them, then it means they were good. He’s pretty skeptical of beans in baked goods. Jes! I’ve so missed keeping up with your blog, so I’m happy to see you MoFoing it up! I feel you on posting just to get rid of lack-luster photos, but I’m trying to get over that point of view. As long as the pictures show off how delicious the recipe is, I couldn’t care less! Thus, I adore this post and your bread itself. I’m totally into the no-hassle factor, since I’ve been too busy to make a proper loaf lately.